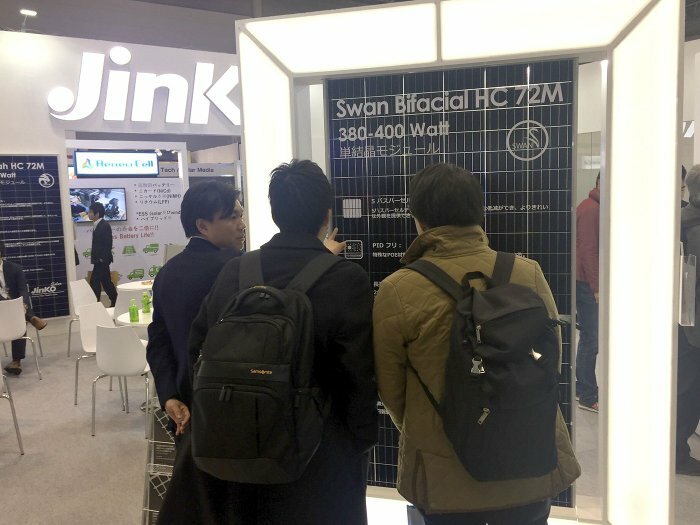 At the 2019 International Photovoltaic Power Generation Expo in Tokyo, DuPont Photovoltaic Solutions, together with JinkoSolar Holding Co, debuted the new Jinko high-efficiency bifacial module “Swan” protected by clear DuPont Tedlar PVF film-based backsheet. The bifacial panel named Swan will be the latest addition to JinkoSolar’s Cheetah premium range. With a combination of high-efficiency Cheetah bifacial cells and clear DuPont Tedlar PVF film, Swan can achieve a high-power output of up to 400W in the front side and up to 20 percent energy gain from the rear side. Leveraging clear DuPont backsheet materials, Swan can produce the same power output level as dual-glass bifacial module with lighter weight, easier installation and 30 years power warranty. The clear DuPont Tedlar PVF film is an ideal backsheet material for bifacial modules that can generate greater power output. Compared to a double glass module structure, the breathable, clear Tedlar PVF film based backsheets allow for higher reliability, lower operating temperature, up to 30 percent lighter weight, and a lower module installation cost. The clear Tedlar PVF film is expected to be a drop-in with most current manufacturing processes for backsheets and modules with little if any additional investment in equipment needed for most manufacturing processes.